Blass's photo would seem to confirm our own suspicions that the fingerprint scanner has been moved to be adjacent to the camera module, an odd location to be sure, but there's no doubting what that thing off to the right is. We also see a USB Type-C port (I know, it looks a bit uneven, that's just camera distortion), 3.5mm headphone jack, and a bottom-firing speaker. 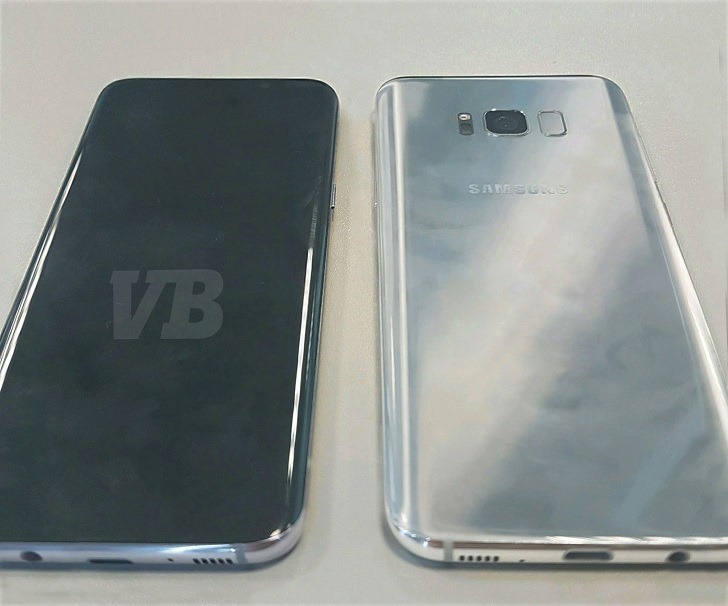 It's a typically-Samsung glass and metal design, quite similar in overall aesthetic to the Galaxy S7, really. But it's the absence of one key feature in this photo that really stands out: there's no physical home button on the front of the phone. We've known for some time that Samsung has planned a move to fully virtual navigation keys, but this the first real visual confirmation we've had. VB also claims that these phones will have massive displays - 5.8" and 6.2" for the regular and "Plus" (which may not be the actual name), respectively. Before you start yelling "too big!" into your monitor, keep in mind: not only is Samsung removing the capacitive navigation keys and greatly increasing the amount of screen relative to body on the phone, the aspect ratio of the display itself is changing substantially. The Galaxy S8 will feature a "18.5:9" aspect ratio panel, which really more appropriately should be called a 37:18, but I guess the former makes for easier comparison. The extra vertical space will house the virtual navigation keys without adding any width to the screen. Using a simple calculation, you can take the Galaxy S7's 5.1" screen and 16:9 aspect ratio to discover that the physical display area has a width of 2.5 inches. If you use that same calculation on the Galaxy S8's alleged 5.8" panel at an aspect ratio of 18.5:9? You get the same figure: 2.5". This means the phone will be no wider for the display, despite the fact that the diagonal has grown a very substantial 0.7". Width tends to also be the key ergonomic dimension for a smartphone, as the wider a phone is, the harder it becomes to actually hold. I did the same calculations for the S7 Edge and the larger S8 "Plus" with its 6.2" screen, and the conclusion is similar: the outgoing S7 Edge has a display width of 2.7", with the S8 "Plus" matching that figure. Combined with the major bezel reduction, this definitely leads me to believe VentureBeat's figures here are legitimate, and I don't think the S8 and S8 Plus will at all be unwieldy in the hand, no more than their predecessors were. The one letdown from this leak? The batteries. They haven't grown at all over last year, and will be 3000 and 3500mAh for the regular and "plus" model, respectively. Those aren't figures I was hoping to see, but there they are. As for CPU, the report mentions an unspecified 10nm chip, but it's unclear if this means Snapdragon, Exynos, or both depending on market. Last year, the Galaxy S7 and S7 Edge featured the Snapdragon 820, but only in the US and China. The rest of the world got the Exynos version. Perhaps the same will be true again this year with the Snapdragon 835 and a next-gen Exynos - we'll have to wait and see. VB also confirms the previously-rumored DeX desktop operating environment with dock, a marginally improved camera, 4GB of RAM, curved screens on both models, and an April retail launch. Specifically, a March 29th Unpacked event for the reveal, and April 21st for sales. Pricing was included for the European market, and if you're in the EU, you're not going to be happy about it: Allegedly, Samsung is upping the MSRP substantially this year, with the standard S8 costing a staggering €799 (remember, storage now starts at 64GB), while the larger "Plus" model will be €899. For comparison, Google's Pixel starts at €759 (32GB), while the XL would match the price of the S8 "Plus" at the same €899. As to what this might mean for American pricing, we really can't be sure. The Euro isn't doing very well, and many phone manufacturers are upping their prices in the EU to compensate for its lower value in the last year or two. Still, given the larger display panels and bump in minimum storage, I wouldn't be surprised if prices in the US for these phones are at least incrementally higher than last year's, but we don't have any information either way on that at this time. You can check out the full report at VentureBeat, below.